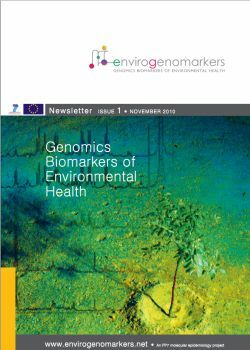 EnviroGenomarkers is a European FP7 research project aiming at the development and application of a new generation of biomarkers to study the role of environmental agents in human disease. 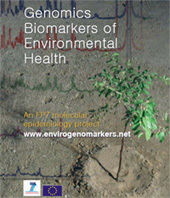 c) the discovery and validation of biomarkers of exposure to the above environmental pollutants. The conceptual basis of the project is depicted in the scheme. Cancer-related biomarkers will be developed by conducting a case-control study nested within the Northern Sweden Health & Disease Study and EPIC-Italy cohorts, which contain biosamples collected prior to disease diagnosis, dietary, exposure and life style information and follow-up health histories. Biomarkers related to chronic diseases, which establish themselves in early childhood but persist into adult life, will be evaluated using the Rhea mother-child cohort on the island of Crete. Biomarker searches utilize state-of-the-art metabonomics, epigenomics, proteomics and transcriptomics, in combination with advanced bioinformatics and systems biology approaches. Exposure assessment utilizes established exposure biomarkers, questionnaires, modeling and geographic information systems (GIS)-technology as well as additional data derived from other projects. An FP7 molecular epidimiology project. If you experience problems opening .pdf documents on this site, please use Adobe Acrobat editions 5.0, 7.0 or later. Alternatively, right-click on the document link and "Save as".